Karen Stalls In Gulf; Maximum Winds Fall To 30 MPH : The Two-Way "Karen is expected to become a remnant low later today," the National Weather Service says. In the next two days, Karen is predicted to shift a bit to the east, taking its center just south of the Alabama and Mississippi coast later Sunday. 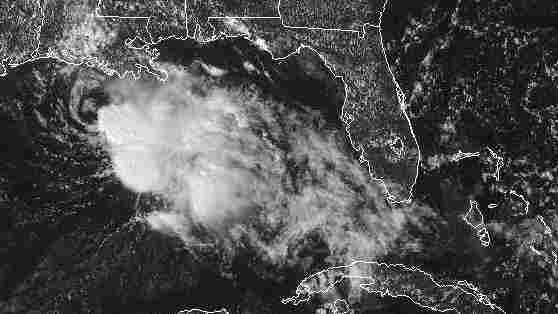 A GOES satellite handout photo provided by the National Oceanic and Atmospheric Administration shows Tropical Storm Karen churning in the Gulf of Mexico on Saturday afternoon. Karen, the second named storm to hit the U.S. this hurricane season, has weakened into a tropical depression. Karen, once feared to hit the U.S. Gulf Coast as a hurricane, has stalled out and weakened into a tropical depression. The National Weather Service says the storm is "drifting" at 2 mph, moving toward Louisiana's southeastern edge. As of early Sunday morning, it was about 165 miles west-southwest of the mouth of the Mississippi River. Forecasters say that heavy rain and a storm surge may cause localized flooding in low-lying areas along the coast, but no widespread weather warnings or watches are in place. In Louisiana, an evacuation that had been mandatory was degraded to a voluntary evacuation on Saturday. "Maximum sustained winds have decreased to near 30 mph," the National Hurricane Center said on Sunday. "Karen is expected to become a remnant low later today." In the next two days, Karen's path is predicted to shift a bit to the east, taking its center just south of the Alabama and Mississippi coast later Sunday and tonight, and passing over parts of Florida's panhandle on Monday.